A mountain biking project in southern Scotland has been credited with generating £9m annual visitor income and more than 200 new jobs. The 7stanes scheme covering Dumfries and Galloway and the Scottish Borders was first set up six years ago. A survey commissioned by Forestry Commission Scotland shows visitor numbers have now hit 400,000-a-year. Environment Minister Mike Russell said the area had become a "world class mountain biking destination". Mr Russell said the project had played a vital role in helping to boost rural economies after the impact of the foot-and-mouth crisis in 2001. 75% of riders describe trails as "very good"
"The trails and facilities that the 7stanes have put in place have created an opportunity to raise Scotland's profile on an international level," he said. "But, of much more importance, it has attracted many thousands of visitors to the area, providing a much needed boost to the local economy. "This report reinforces Scotland's reputation for great riding, but also demonstrates the significant successes that can be achieved by working in partnership." 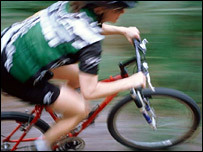 The 7stanes is a series of mountain biking trails dotted across southern Scotland. They are at Glentrool, Kirroughtree, Dalbeattie, Mabie, Ae, Glentress and Newcastleton. David Gass, of Scottish Enterprise Borders, said the study showed the importance of the project. "We are delighted that the evaluation has shown significant economic impacts across the south of Scotland and investment by the private sector," he said. "This project demonstrates the effectiveness of partnership working and provides a great platform for the south of Scotland moving forward in the adventure sports market."